It is again the time of year when Chinese people give hongbao, or red envelopes containing auspicious money, to wish prosperity and good fortune. For technology companies, however, this has been an annual battlefield to entice users to stay glued to their respective services through financial incentives and promotional offers. Alipay, the country's largest third-party payment tool by market share, announced on Monday it is offering subsidies totaling 500 million yuan (73.7 million U.S. dollars) to users who participate in a campaign that can effectively enhance user loyalty to the Alipay app. From January 25 to February 4, an augmented reality-powered game allows people to collect virtual red envelopes by scanning the Chinese character fu, which symbolizes fortune and luck in Chinese and is commonplace ahead of the Chinese New Year, which falls on February 5 this year. The activity aims to leverage the popular tradition to promote Alibaba's mobile payment service. It also ties into a series of events that promotes Alipay's array of services, from ecological protection scheme Ant Forest to Huabei, a consumer credit service. For instance, those who have gathered five fu representing different blessings stand to equally split the cash prize, plus extra offerings including paid trips to Europe for football matches and a full-year reimbursement of all loans incurred on Huabei. The company said up to 100 million people have been engaged in the activity since its debut in 2016. It has also seen the participation of 70 million elderly people and users from 2,000 overseas cities for three years in a row. This year it is also inviting local residents in Hong Kong to join the game through AlipayHK, the namesake payment wallet dedicated to the local market. "Chinese people have a tradition to send greetings and hongbao to each other during the Lunar New Year, making it the best time for companies to build up brand awareness and increase the number of users on their apps, especially in rural areas," said Neil Wang, president of consultancy Frost & Sullivan in China. In recent years, China's major Internet companies have signed up as sponsors for the annual China Central Television Spring Festival gala to conduct red packet promotions, which have allowed them to keep customers engaged with their apps as long as possible even during the country's most important holiday. Following WeChat, Taobao and Alipay, search engine Baidu Inc entered the fray this year by allocating up to 1 billion yuan of digital cash to be disbursed in the lead-up to the Year of the Pig. The free money is deposited directly in the recipients' accounts with the app operator. The recipient can use the digital cash for future purchases via the app or resend it as a gift to friends and relatives who are using the same app, thus maximizing the level of participation for existing users and drawing in new customers. Under a promotional campaign that ends on February 4, participants who download and use China UnionPay's QuickPass app to scan objects bearing the company logo are eligible for cash prizes of up to 2,019 yuan (297.8 U.S. dollars). 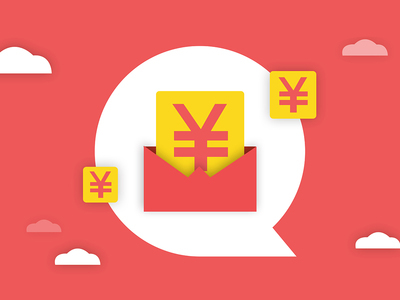 The promotion, known as the "red packet feast", will also include other cash gifts if people sign onto the app on a daily basis, recommend new users and transfer funds via the tool. Tencent, which initially came up with the idea of digital hongbao in 2014 and categorically boosted the prevalence of WeChat Pay, is not offering big subsidies this year. It has only rolled out a functionality that allows enterprises and organizations to tailor their red packet cover. China's 43.8 trillion-yuan (6.5 trillion U.S. dollars) third-party payment market is dominated by Alipay's 53.7 percent and WeChat Pay's 38.8 percent, according to market consultancy Analysys in December. "While highly unlikely to shake the duopoly, smaller players could still eat away limited shares because vivid application scenarios are key to the adoption of payment solutions," said Wang Pengbo, an analyst from Analysys.